In Part II, I am sharing what I personally look for in a finished nature photograph that can reasonably be described as fine art. There is no substitute for mastering one’s craft. This is true in all art disciplines. Artworks may be created as personal expressions. But the great majority of them are intended to be shared and hopefully appreciated by others. The level of positive response has a high correlation with the artist’s skill. The term fine art was originally used to describe work created by highly trained and accomplished sketchers and painters and later was applied to other art forms. For the photographer, this means developing deep knowledge about subjects, optics, art principles and, more recently, about digital image editing programs and techniques. If a nature photographer has a message that he wants to convey in a specific image, even if it’s only how intriguing and beautiful nature is, he or she must be able to present it clearly in the finished product. A picture is only worth a thousand words if the message is well defined and unambiguous. When I took the above image, I went to the San Diego Zoo to test my new Sony FE 70-200mm f2.8 GM lens primarily for selectively focused close-up images with excellent bokeh. (Some of this will be the subject of Part III.) Then I noticed this quiet and prolonged confrontation between a pair of nesting White-Breasted Cormorants on exhibit and a wild Blue Heron from a nearby estuary. 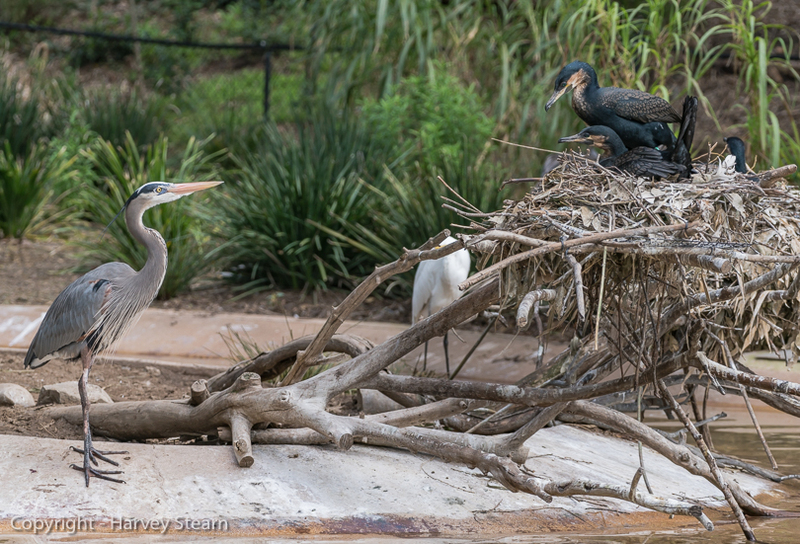 This exhibit featured the cormorants and Great White Pelicans from Eastern Africa. However, Wild Blue Herons and Great Egrets are frequent visitors taking advantage of regular feedings conducted by the zoo-keepers. Blue Herons are voracious and will eat small birds. This heron was aware that the cormorants might be nurturing young chicks. In the hour that I watched this interaction, he never took his eyes off the cormorants; and they raised a ruckus every time that the heron attempted to get closer. The message here is that while nature photographs routinely portray nature as beautiful and intriguing, they rarely reveal the underlying tension that comes from competition between creatures trying to survive and reproduce. Okay, so this isn’t a nature photograph! But, it is an urban landscape; and it has a message that nature photographers can appreciate. 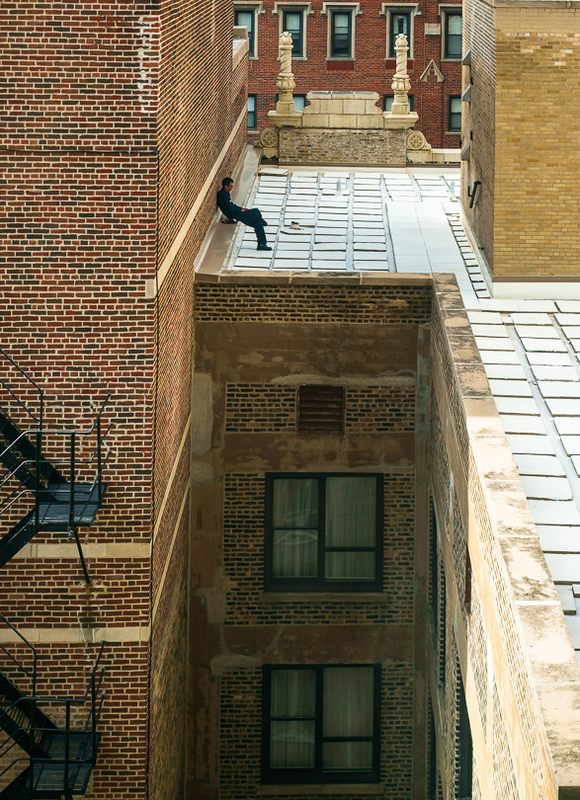 In a bustling city like Chicago, it’s hard to find time and a place for a quiet moment. The young man dressed in black took five minutes out on the roof to get away from people and the ever-intrusive assault on one’s senses. Beautiful, natural open space that outdoor photographers treasure is conspicuous by its absence. In addition to the message, this image also benefits from its graphic form, a quality discussed later in this article. One of the most difficult disciplines for nature photographers to practice is to limit what’s in the image to only the most important elements. Gratuitous information only dilutes the message and confuses the viewer. I had ample opportunity to photograph this Painted Lady butterfly who had spent almost half an hour on my plate feeding on leftovers. Not only was the surrounding environment irrelevant, it was also unappetizing. As I got up from the table the butterfly flew off and landed on the white patio door. The rest was easy. Only the butterfly and its shadow are in the image. The detail in the butterfly’s wings was all that was important, and the shadow adds drama and counterpoint. This term was coined by Henri Cartier-Bresson, a famous 20th-century street photographer in Paris. It is the exact moment of either peak action or when a dramatic change has just occurred. A single still exposure can suggest the dimension of time in only two ways: either a frozen point in a range of movement or by blur resulting from a slow shutter speed representing movement during that interval. Capturing those brief instances when a dramatic change has occurred, either in the subject or in the lighting, usually, results in captivating and often rare images. 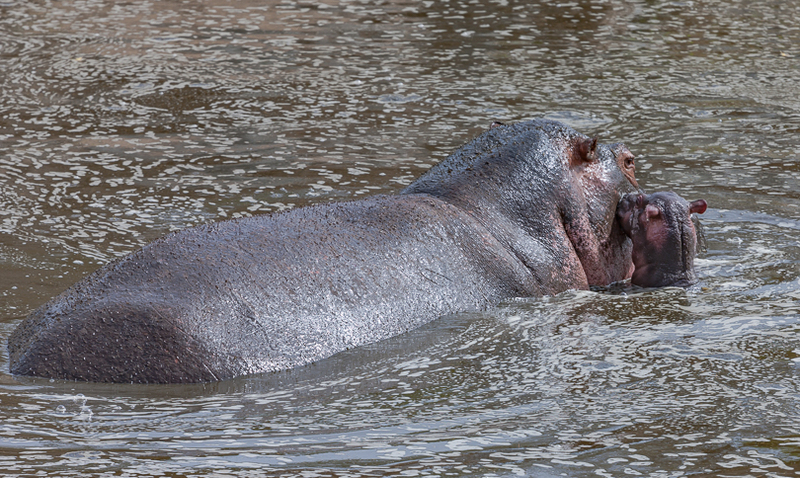 In Tanzania, I watched a large male hippopotamus wade upstream followed by his mate with a baby by her side. There were large crocodiles in the pond where they wound up, and I had a feeling that the baby instinctively knew that its safety was dependent upon staying close to Mom. At one point, as if in gratitude, the baby rose above the water and appeared to plant a kiss on its mother’s face. That scene lasted less than a second. But, I was able to react quickly. 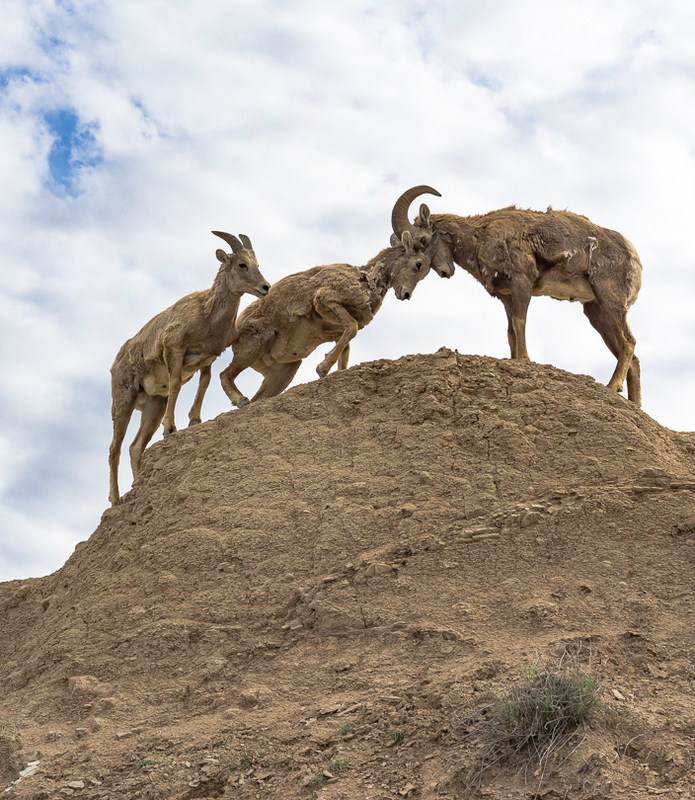 As I was leaving Badlands National Park in South Dakota, a large flock of about 30 Desert Bighorn Sheep moved into view and occupied three small sandy hills and the grassy areas below. The still young patriarch of the group commanded the highest hill which he shared with younger sheep. He readily tolerated their playfulness and stood his ground while one practiced his head butts on him. This image was taken at the moment of the future ram’s maximum exertion. For some strange reason, the forms in this image remind me of Rosenthal’s famous photograph of Marines raising the flag over Mount Suribachi in Iwo Jima during WWII. The right lighting usually makes the difference between a good image and an extraordinary one. However, what is the “right lighting” is by no means absolute. Lighting can be strong and dramatic, or soft and delicate. It can be highly focused or diffuse. It can cover the entire image or only parts of it. The challenge for nature photographers is to have experience with all kinds of lighting, recognize opportunities when they occur, and be prepared to adjust quickly to capitalize on it. It helps to anticipate lighting direction at different times of day, and at different times of the year, and to have detailed prior knowledge of likely weather conditions. This is an old image taken on Kodachrome film 40 years ago. My wife and I were driving back from a ski trip at Mammoth Mountain in California. It had snowed heavily in the mountains for two days. As we reached the Owens Valley below, I could see that the ground was clear. 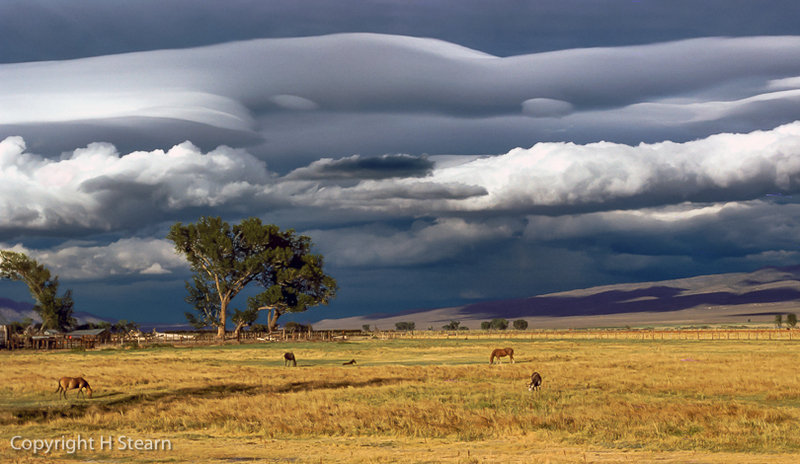 But, the sky looked ominous, with clouds wildly stretched, and including at least ten lenticular clouds formed by strong wind shear. Just as we passed one of the many ranches in this area, the sun shone briefly through the heavy cloud layer and bathed the ranch in an unusual golden light. I parked the car and grabbed my camera with just enough time to make two exposures. This would have been a pretty scene in normal circumstances. But, the unusual sky and lighting made it almost unique. Before we left for Tanzania, I already had an idea of the type of lighting that I would encounter in June, and it wasn’t going to be great. The rainy season ended, and I knew that strong sun and a thin cloud layer would result in harsh hazy-bright lighting most of the time. That was the case with this image, except for one phenomenon that I hadn’t considered. 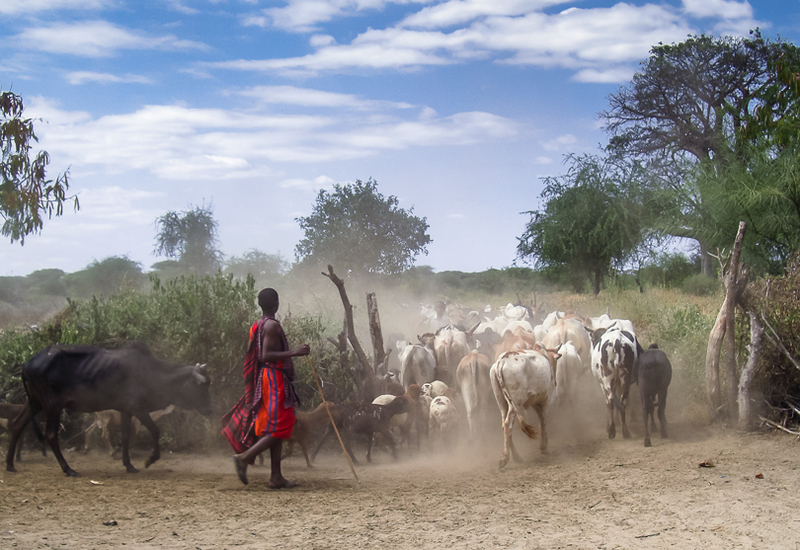 As the Maasai herded their cattle to pasture, they raised small clouds of dust that further diffused the light. This gave the scene a soft dreamy quality, except for the young Maasai herdsman who walked outside the dust cloud and was rendered sharply. This is one of those photographs that resembles a classic painting. The ability of a good lens to resolve fine detail with smooth tonal transitions can create photographic images that rival the best drawings. Leica’s optical designs and precision led to a new genre in the mid-twentieth century logically referred to as “Leica Photography”, especially with monochrome film and paper. They’re still doing that. But, with new lens designs and manufacturing processes, so are other manufacturers. I’ve said it before; and again, “We’re living in a golden age for photography”. This is another of those circumstances in which I was disappointed, only to find out that Nature had a better plan. With a cloudy sky shaping up on the Snaefells Peninsula in western Iceland, I thought that I would be able to capture a good sunset. 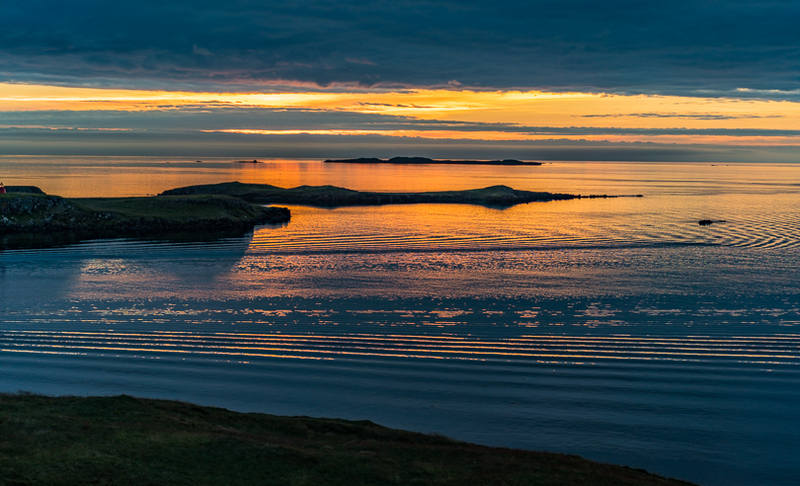 I hiked the small mountain in Stykkisholmur that overlooks the harbor to have an unobstructed view of the many small islands and the setting sun. Though the sun only lit up a small part of the cloud layer, it strongly illuminated the water, particularly the tops of the small ripples and wavelets, creating a graphic effect that my Sony Zeiss 55mm f1.8 lens crisply rendered. I’ve photographed this lovely mountain view many times. On this particular trip, I carried a Sigma DP3 Merrill camera with a Foveon sensor. I am fond of this sensor technology because it renders scenes with copious fine detail resulting from a 100 percent sampling of light transmitted through the lens, yielding extremely high color accuracy. (I recently bought the new Sigma SD H camera which produces the same quality, but with higher total resolution.) 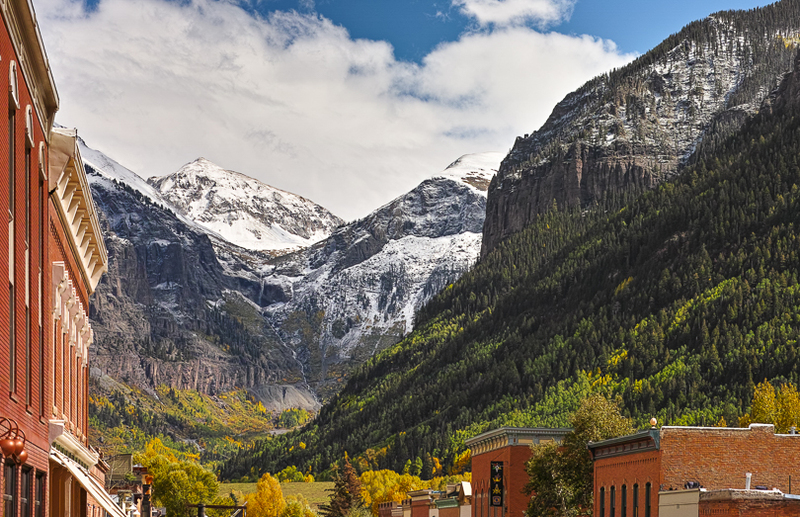 Prior to taking this photograph, I decided that the old brick buildings would frame the mountains beautifully and that the crisp detail and accurate color required to make this work was possible with this camera. The resulting image looks extremely real and provides a good perspective of what people see when they first walk through town toward the mountains. As mentioned in Part I, there is a growing tendency for photographers to see the maximum initial impact in their images to make them stand out in a crowd of competing images. This is understandable. But, it neglects one of the rich traditions of fine photographic art. This ethic requires that the image is not overstated and that there is subtle detail within that is increasingly noticed as the viewer spends more time studying the image. Such images tend to outlive fads and become classics. Because this image looks like a monochrome, the normal tendency would be to make it darker and higher contrast. This would be wrong since it would obscure detail that keeps revealing itself as one studies the image more closely. First, it is all natural color that isn’t appreciated until you notice small green plants scattered among the basaltic columns. Second, the maximum detail allows the viewer to see that the area around the cave is a small seagull rookery. There are at least 20 nests scattered among the rocks. And, in addition to the seagull flying through the mouth of the cave, there are seven others sitting on, or close by, their nests. Again, the tendency today would be to increase the contrast of this image to give it more impact. However, this was taken at a high northern latitude and after 10 PM when the sunlight was very delicate. A sharp high contrast image would look out of place, particularly with the pink hues developing in the clouds and on the glaciers. At this image was taken from Highway 1 on the way to Hofn, the empty road is part of the story, and creates an air of mystery. All treatises on two-dimensional art stress composition and visual balance. And, this article does that as well. Composition is needed in an image to keep the viewer’s focus within the image and moving around to explore all its elements. In addition to balancing defined areas, good compositional balance can also contrast warm colors cool ones, and light tones vs dark ones, to provide dynamic tension, and keep the point of focus moving around the image. 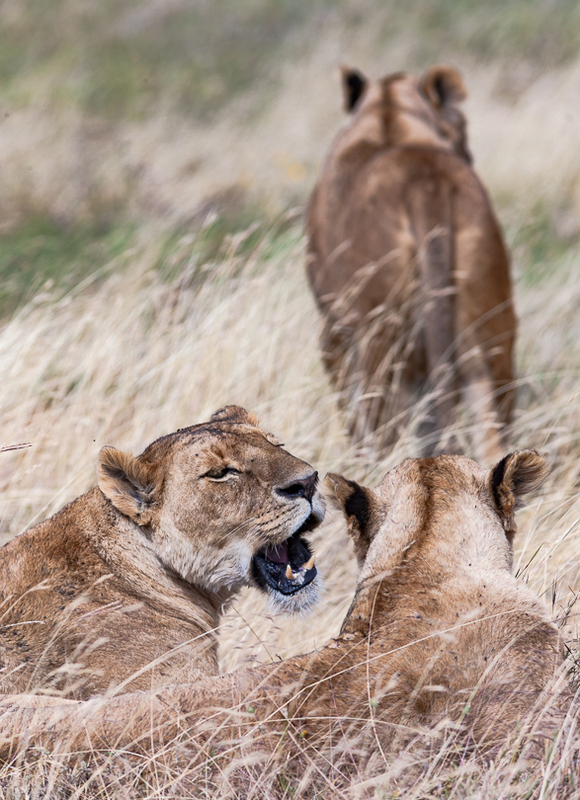 The above image is simple and uses the mass of the departing lioness as a spatial balance to the lower mass of the other two cats. The primary emphasis is on the two lionesses in sharp focus who appear to be having a conversation. This reflects the typical homocentric perspective that people tend to have when viewing animal behavior. We all tend to interpret what animals do based upon how we as humans interact. Taking this a step further, the cat in the lower left appears to be whispering a comment behind the back of the retreating cat. Hence the concept for this image, and its title. 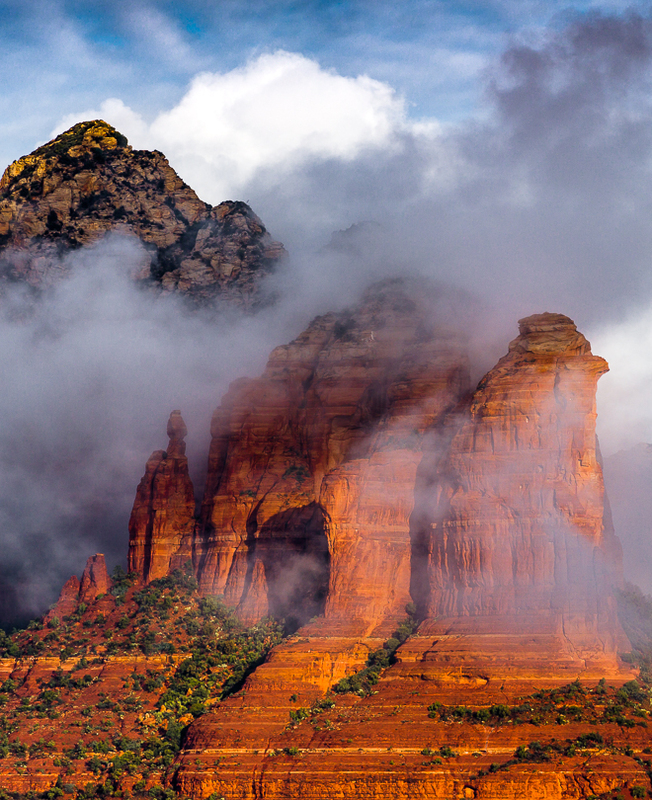 This image of Coffeepot Rock was taken at the end of an early morning rain. It gains strength from a compositional balance of strong diagonals at right angles to each other forming an X pattern. The contrasts of light and dark tones and cool and warm colors increase visual excitement. These balances are also maintained in a compact almost square composition that leads the viewer to explore all aspects of the image. 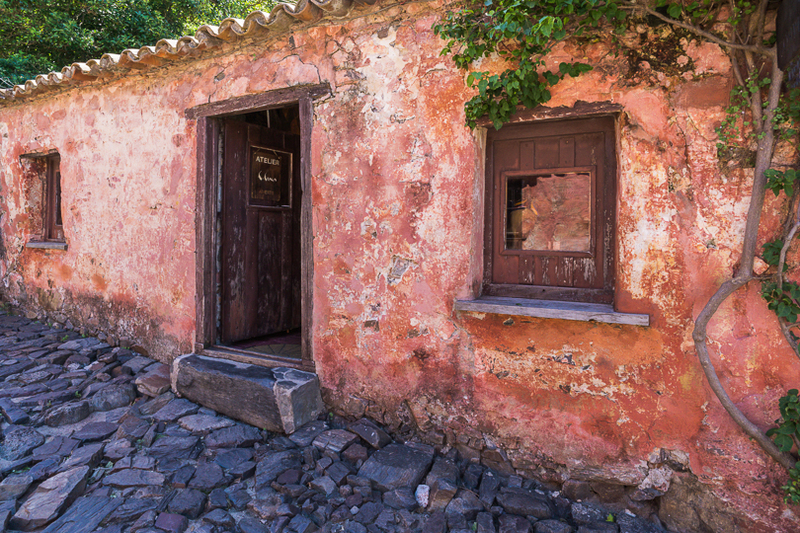 Though this is not a natural landscape, it is an old street scene of 300+-year-old buildings and the original cobble. It’s also another good example of strong diagonals, color and tonal contrasts suffused with rough textures. It has a painterly “feel”. Now and then, landscapes exhibit repeating patterns and large numbers of dynamic lines. These are fun to photograph and present a side of nature that is more prevalent than most people would believe until they start looking with trained eyes. All of Iceland is made up of dark basaltic lava. 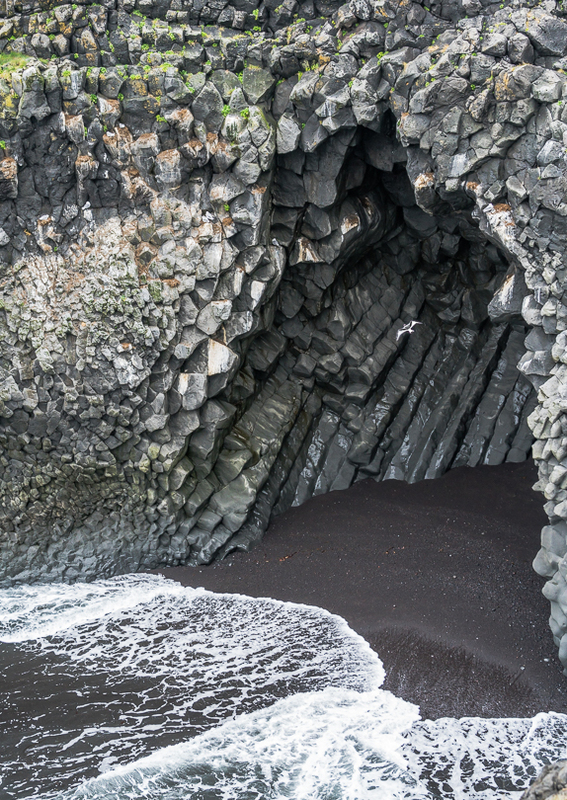 This type of lava tends to cool into a rough columnar structure which, under pressure and over time, cracks and bends in ways that further emphasize the individual columns. The west part of Iceland contains the more ancient lava flows. Along the coast, there many of these structures have been exposed by wave action and strongly weathered over countless millennia. 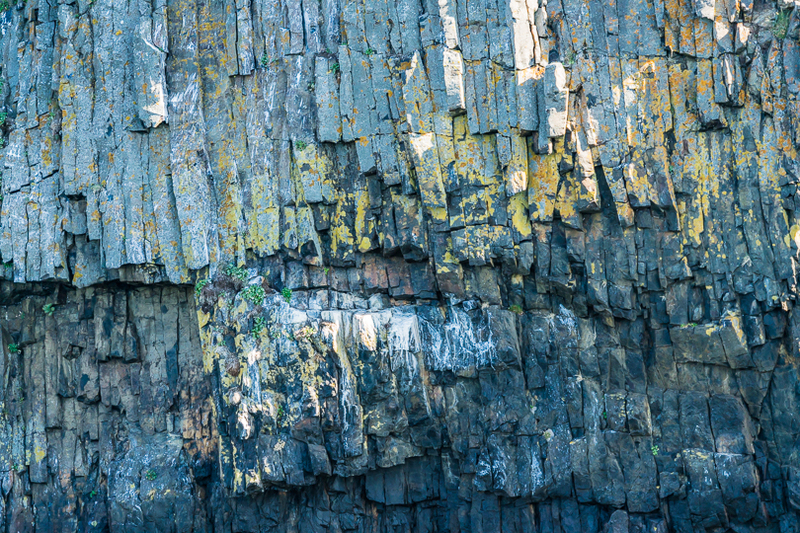 The columns shown here constitute the edge of a small island off the coast of the Snaefells Peninsula and have been made colorful by plants, algae, and bird guano. The result is an appealing semi-abstract image. 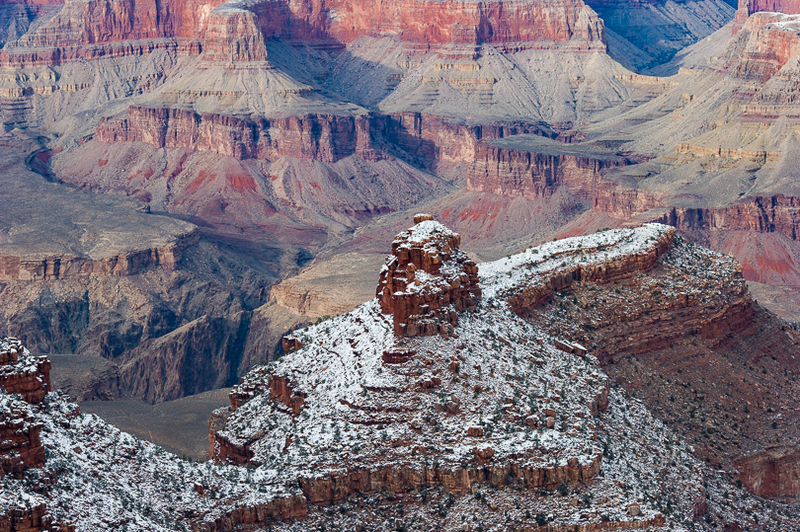 This view from the South Rim of the Grand Canyon appears in millions of photographs and paintings. What is different here is the decision to zoom in with a long lens to restrict the view to one stretch of eroded sandstone formations which have evolved into very similar shapes. They remind me of puzzle pieces, which is why I titled it “Jigsaw Puzzle”. There are certainly other successful concepts and techniques used to produce photographic images of nature that can easily be considered as fine art. The above list is a starting point for photographers who wish to pursue this direction. 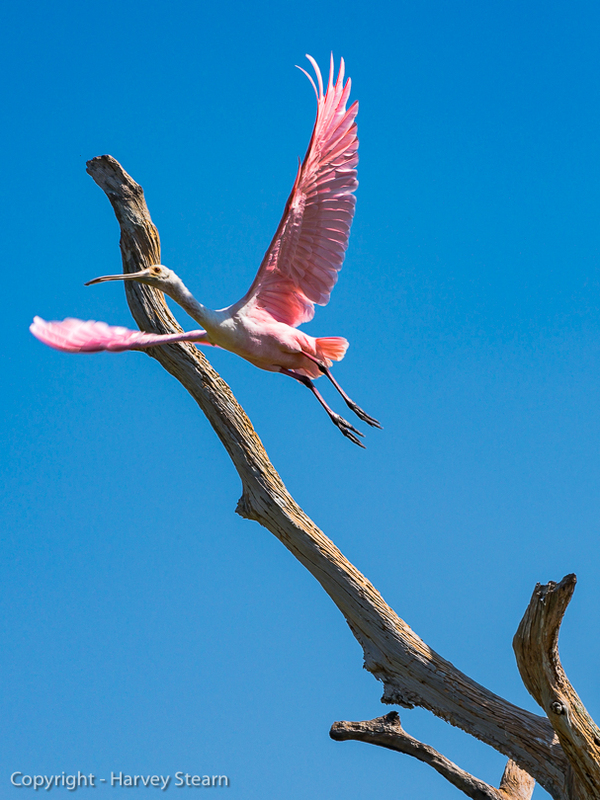 Part III will cover how a fine art nature photographers typically select and approach his subjects, and the processes leading to the creation of fine art images. 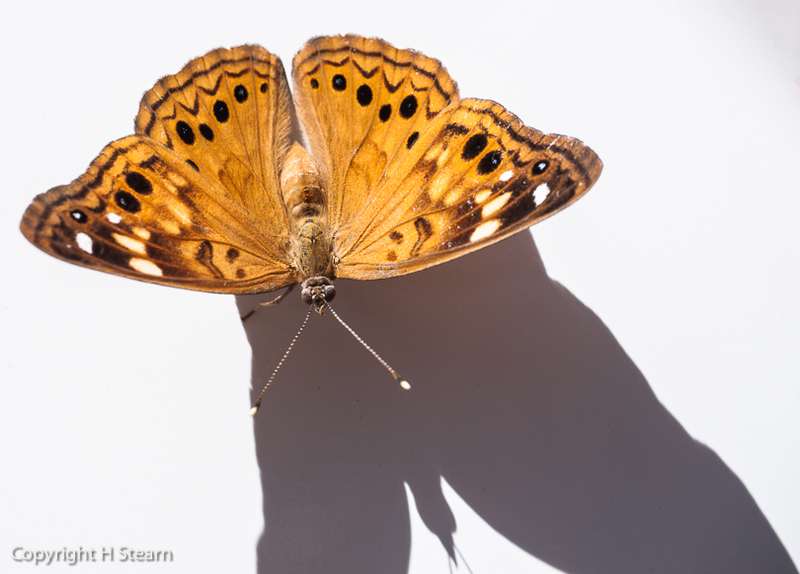 Harvey Stearn has photographed nature and made his own prints for over 65 years. He was Chairman of the California Arts Council, a state agency in which he was a member for nine years. As such he was deeply involved with setting policy for public support of the arts. In a similar vein, he served on the State Arts Grants Panel of the National Endowment of the Arts for two years and was the founding Chairman of the John Wayne International Airport Arts Commission which curates and organizes art exhibitions within the airport facilities in Orange County, California.